wanderlust ATLANTA: Lions Invade Atlanta...Atlanta Loves It! 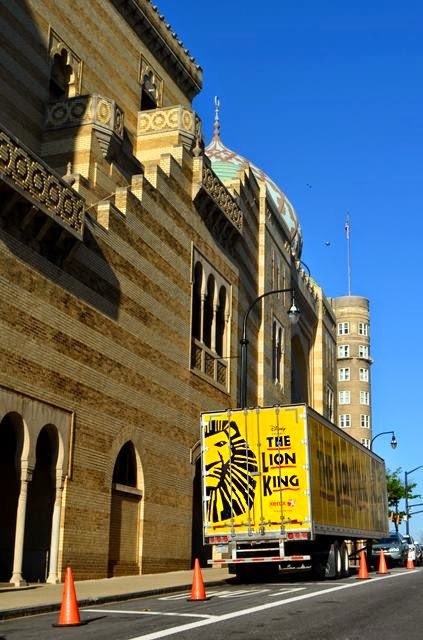 The Lion King opened at The Fox Theatre last week and I was there! I won four tickets to opening night by winning a giveaway conducted by a tourist-favorite magazine, Where Atlanta. I was blown away by the performance! The puppetry—the interpretation, the technical marvel, the artistry of the acting and dancing—is brilliant! The acting and singing are superb. The stage's design and all its moving parts brought the performance alive! 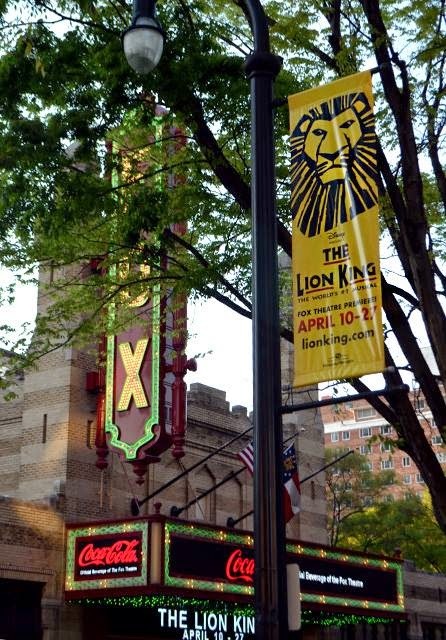 I just can't say enough good things about The Lion King at one of Atlanta's most beloved icons, The Fox Theatre. But let me back up. My story of The Lion King, its most recent iteration at least, begins with a frog. Well...it begins with a Facebook giveaway that ultimately leads to a photograph with a frog. Where Atlanta conducted a giveaway on their Facebook page for tickets to see The Lion King. All you had to do was share a photo of yourself reading Where Atlanta magazine. Simple enough, right? Well, I procrastinated—I wish I could say that I was super busy, which wouldn't be a lie at all, but everyone's busy, right? It wasn't until the last day that I submitted my entry...and I was the last one to enter, too. I'd picked up a copy of Where Atlanta magazine at Underground Atlanta, where I ran into my buddy Stephen, new father and tour guide at ATL-Cruzers. It was great to catch up with him and learn about their new segway and food tours! As a docent at the Atlanta Botanical Garden, I'm familiar with their amphibian research and conservation efforts—quite remarkable and admirable, I must say. And I love it when I see visitors making photos with the larger-than-life frogs throughout the Garden. 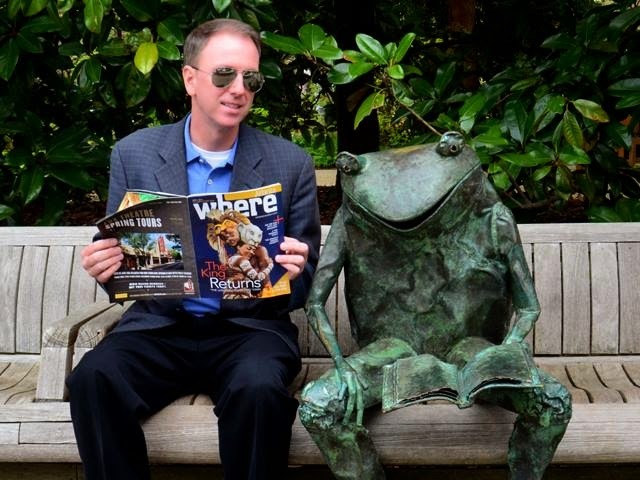 I thought it was rather clever of me to make a photo with the frog in the Garden that's reading a book...the frog is reading, I'm reading—fun! Thanks to a visitor from out of town who I asked to make the photo for me, I think it turned out great...now one of my favorite photos. Of the submissions for the Where Atlanta giveaway—and there were some super fun photos!—I won, in a random drawing, four tickets to see The Lion King at The Fox Theatre! But, as it turns out, the prize was more bountiful than I thought. In addition to Lion King tickets, I also received four tickets to Zoo Atlanta—to see the lions, no doubt—and a gift card to Hard Rock Cafe! Thank you, Where Atlanta! Early next month I'll be going to—and later blogging about—Zoo Atlanta with decades-long-friend Mary Jo and her boys. That's going to be a fun outing! If you drive down Peachtree Street right now, there is absolutely no doubt that The Lion King is in town. They're rather brilliant to park one of their trailers on North Avenue (above photo), near Peachtree Street—kudos to their Marketing staff. When I drove past the trailer, it super-amped up my excitement to see the show. The street banners lining Peachtree Street served as a constant reminder of the wonderful performance I was destined to experience. I've been impressed by the street banners in Atlanta...they're consistently tasteful, unobtrusive, and serve as reminders of shows, performances, or initiatives that I want to see and support. And I love the marquee at The Fox Theatre. 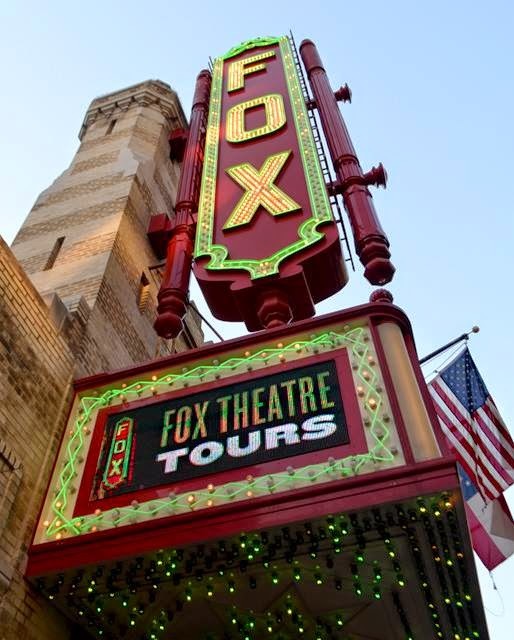 Did you know that if you host a private event at The Fox Theatre, one of the package options is to rent the marquee? I've seen wedding messages, congratulatory messages...how cool to have your name in lights! At the Fox, nonetheless! The evening of the performance, I met friends at Livingston Restaurant + Bar in the Georgian Terrace. 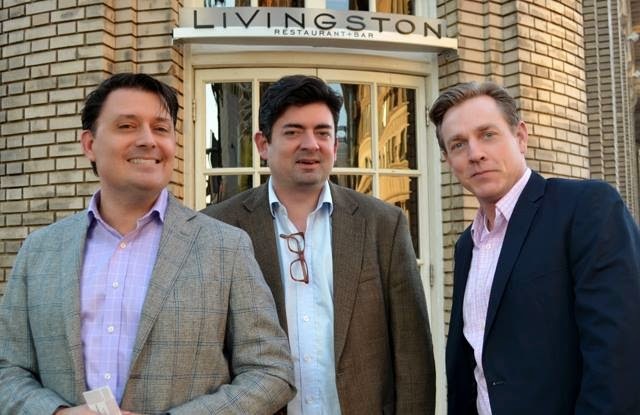 Livingston is one of my favorite Atlanta restaurants and often where I'll dine or enjoy a libation prior to seeing a show, performance or film at the Fox. Did you know that the cast of Gone With the Wind stayed at the Georgian Terrace during the premiere activities in Atlanta? Open nearly two decades before The Fox Theatre, the hotel itself has a grand history. I've been a hotel guest, attended special events there, and dined in its restaurants, all of which have consistently been great experiences. 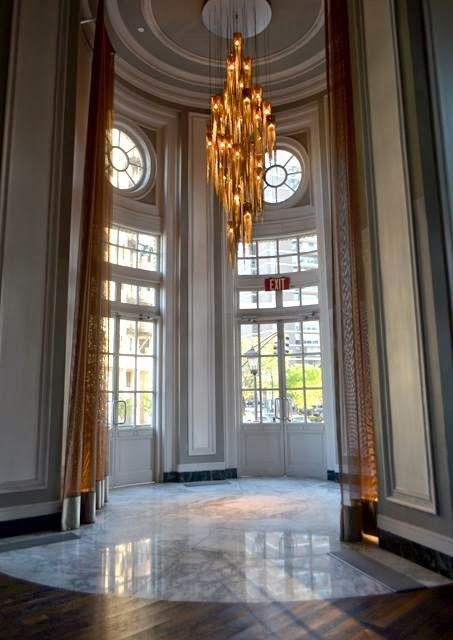 I love the chandelier just inside the North Avenue and Peachtree Street corner entrance (photo above). And it's a fun place to meet for a drink or dinner prior to a show...or 'just because', which is my favorite reason! Seeing The Lion King was something I wanted to experience with friends, and people who appreciate the performance arts, as well as people I thought would enjoy The Lion King AND each others company. I sometimes find it challenging to put together even a small group...the amount of travel that Atlantans engage in is mind-boggling, as well as the general busyness of your average Atlantan. But I was very happy to have great friends Perry, John and Barry (pictured above, left to right) join me for the performance. We all had a great time! If you're on the fence about whether or not to go see The Lion King at The Fox Theatre, get off the fence and go! And while you're at it, head over to the Center for Puppetry Arts to see several of the masks used in the Broadway production of The Lion King. In a temporary exhibit, "THE LION KING: Up Close" features four amazing masks and a Zazu puppet...amazing! Oh, and a behind-the-scenes tour of The Fox Theatre would be cool, too. The Lion King is playing at the Fox through Sunday, April 27, 2014, which doesn't leave many opportunities to see it, considering how busy we all are. Make the time to see this truly spectacular show! I think this is one lion invasion you'll enjoy.